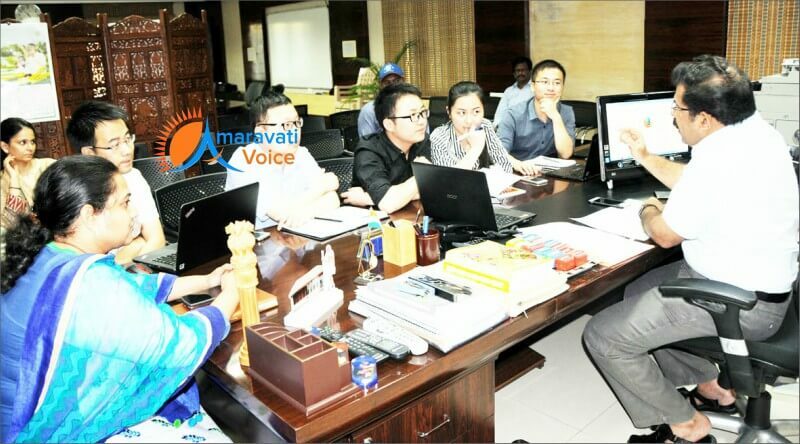 Krishna District Collector A Babu, has conducted a review meeting with China Delegates to construct around 10000 new flats to the poor at Jakkampudi. Chief Minister Chandrababu Naidu will soon lay foundation here to construct the new flats. Collector has told the China Delegates who will be giving their help in the construction, that the flats should be built with all amenities. Under JnNURM scheme, Vijayawada Municipal Corporation has already constructed 8000 houses at Jakkampudi village and many families are staying there. Entire land at Jakkampudi was acquired from farmers on 40:60 development bases in which the land owners were provided with best infrastructure including roads, water, electricity and drainage facilities. The project is being executed in two phases. Phase I covers an area of 226 acres with 8,000 houses that have been built already. Phase II will cover 787 acres. All together, the project is expected to build 25,000 houses. From Jakkampudi it is connected to the main city with 40-ft wide all-weather BT roads. VMC has built a flyover over a railway crossing that alone has reduced the distance by 4 km. It has also built an inner ring road, integrating the area to the main city. The colony is now just 5-8 km away from the central business district.